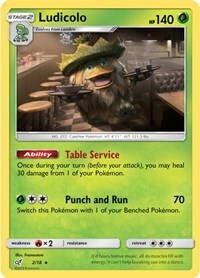 Ability: Table Service: Once during your turn (before your attack), you may heal 30 damage from 1 of your Pokemon. [G][C][C] Punch and Run: 70 damage. Switch this Pokemon with 1 of your Benched Pokemon.